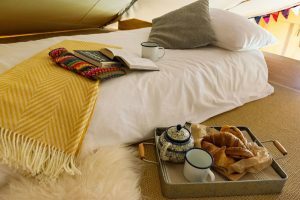 Whilst glamping at Up Sticks you can feats on BBQ food, and treats available from our pantry on site. Next door is our Local pub and there are plenty more to choose from within a few minutes. Picnic on the hills, visit local deli's or pick your own. 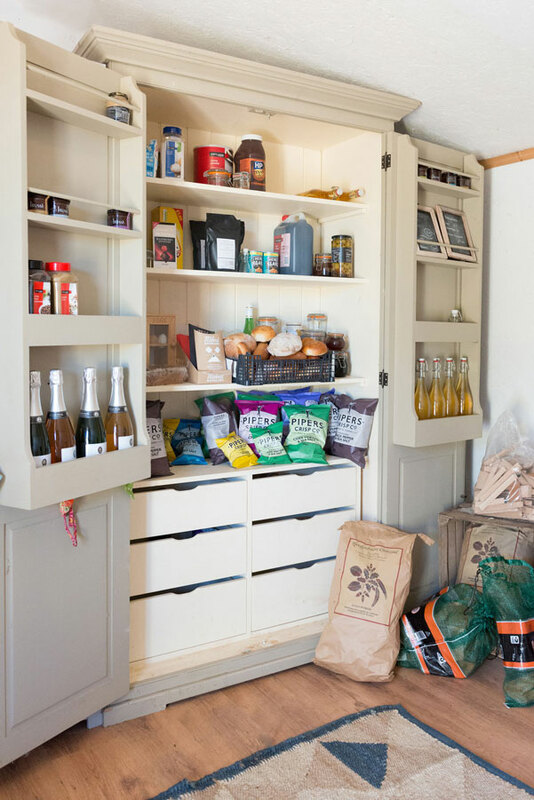 We know food can be as much a pleasure as as chore. So we’ve got lots of options. 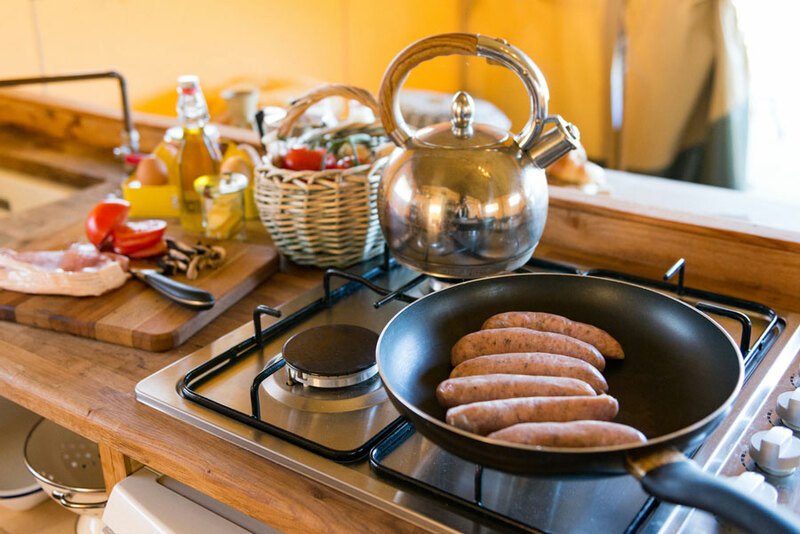 Gather around the Kadai for a BBQ feast under the stars or cook up a storm in the fully fitted kitchen. Order in a home cooked ready meal, or venture out either to our local or a list of impressive gastro pubs. Here at Up sticks you can indulge in eating what you want how you want. 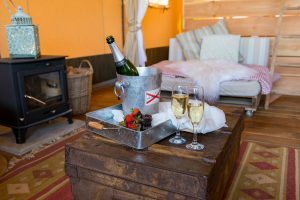 With a dining table, breakfast bar and camp fire seating you can be as formal or laid back as you like. 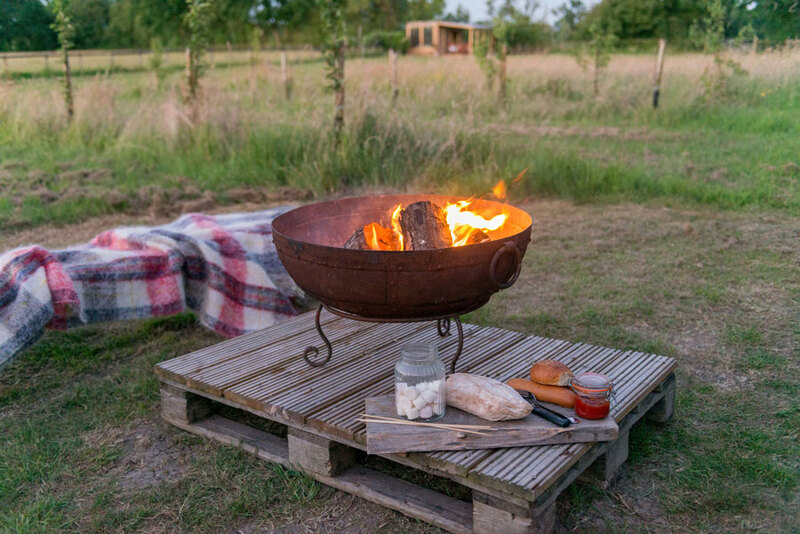 If you fancy going primal why not cook over fire on the kadai – warming a bowl of chilli, or roasting a joint, before Getting the marshmallows out to toast whilst listening to the owls hoot and watching the the moon rise. 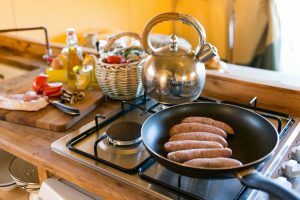 Inside the tent has a kitchen filled with utensils, a fridge, gas hob and sink. So boil your kettle in the morning fill the cafetiere and sip your coffee whilst taking in the view. Much more than pub grub! If you are looking to venture out, there is so much choice. In addition to our local The farmers Arms – just two minutes stroll away; we have three award winning gastro pubs on our doorstep. 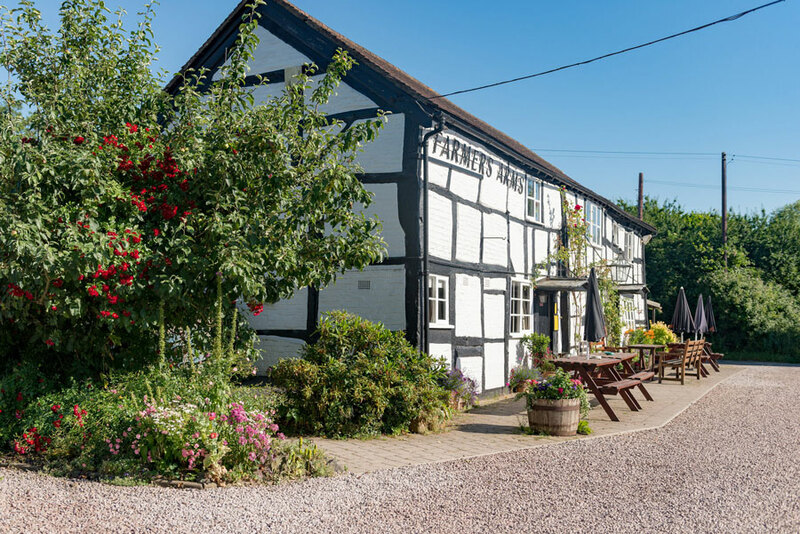 the Hanley Swan Inn (Worcestershire’s pub of the year) Butchers Arms (Michelin starred) and The Welland Inn (Michelin Bib Gourmand) all a short drive or cycle. For restaurants there is curry in Ledbury at the Sitari, or a wood fired pizza & tapas at the Horseshoe Inn. For fine dining The Cottage in thee Woods has amazing views. Just ask and we’ll happily point you in the right direction. 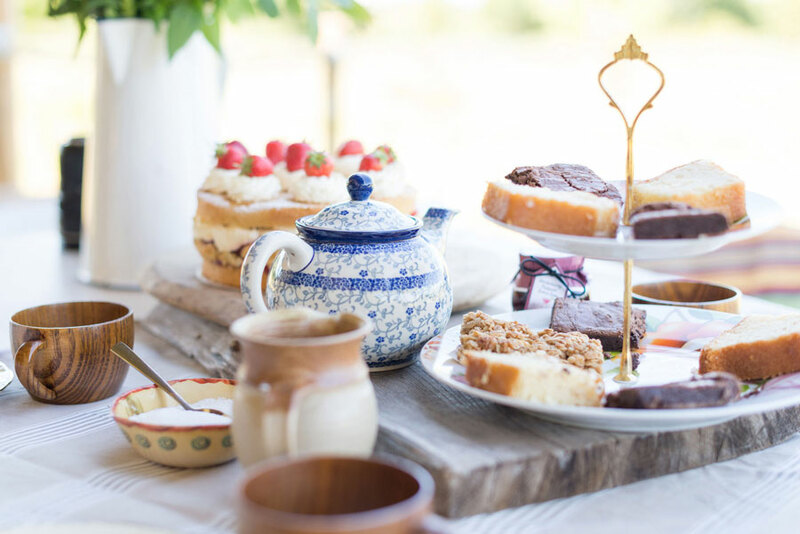 For daytime treats why not cycle to Clive’s Fruit farm for tea and fruit picking. Stop off at The Kettle Sings, or St Annes Well on the hills. The H2o cafe at the Wyche provides a great plac efor kids, information on the hills and lovely cakes. Alternatively we can provide all you need to pack up a picnic and stop wherever and whenever you like. Take a bottle up to the hills and watch the sun set, it’s magical! Our pantry – formally a stable, is full of goodies and locally produced products including fresh cakes, pastries and home made preserves available to buy. As well as everyday essentials like milk bread and butter. Ready packs of meat and veg are available for BBQing, and herbs from the veg patch. 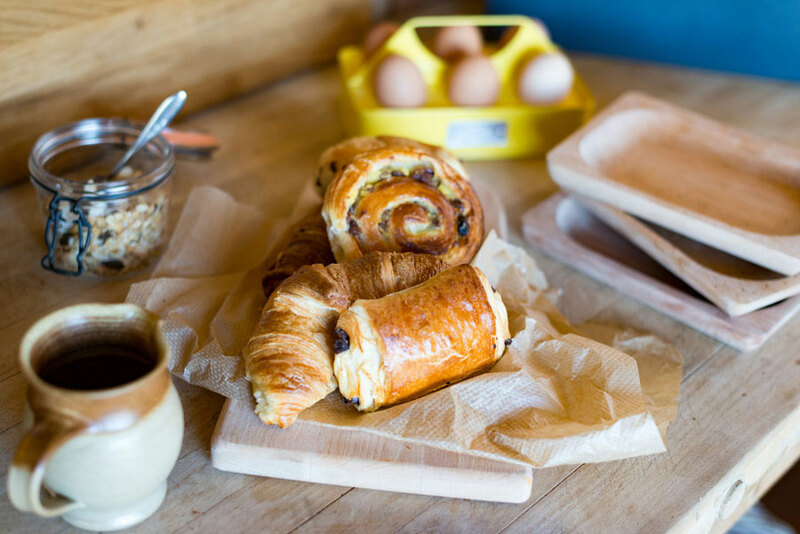 In the mornings wander to the pantry for warm croissant, or pick up a breakfast pack with locally made sausages, bacon and our own eggs. If you’re looking to escape the kitchen, we have a few home cooked favourites available to order. Let us know in the morning and we can have it ready for you to warm up in your tent.